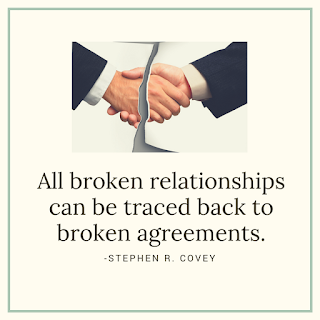 Just recently, a person I am dealing with broke the conditions of our agreement. Not only once but in succession. He did not keep his part of the agreement one condition after the other. I kept quiet. I reminded myself that everything is a blessing. What good can come out of this situation? What is God trying to teach me or show me? Surely, He has a great plan. With that pause and thought, by God's grace, I was saved from diving into anger, bitterness and misery. (1) I was given the opportunity to see how the other person thinks. Were it not for the situation, I would have still believed that the person did not mean to do the wrong that he has previously done and was only forced to do it by the influence of the people around him; With the turn of events, I had the chance to assess that it was his preference not to honor our agreement. Sad but true. (2) I am thankful that I am the one who is in the position to understand and not the one to be understood. Seeking to understand another person opens a window for you to grow, to have a better perspective of where the person is coming from... Why they think that way? A person may have done the wrong thing but understanding will still make it easier for you to face the situation. As for me, I was spared of feeling angry, bitter and miserable. :) Sometimes, just showing kindness to a person helps them realize their mistake without a need to go through a heated argument. (3) I was given an opportunity to exercise forgiveness. According to Dr. Wayne Dyer, "You practice forgiveness for two reasons: to let others know that you no longer wish to be in a state of hostility with them and to free yourself from the self-defeating energy of resentment. Send love in some form to those who have wronged you and notice how much better you feel." I did send love and I felt great and liberated! (4) Strengthed relationship between God, me and my husband. The situation only enabled me and my husband to work hand in hand in facing life's challenges and turn to God for help. It became an opportunity for us to weigh what is more important to us. We called on to God to enlighten us and to help us see things His way. At the end, you'll see that relationships are more important than money. Money can't buy you peace.